Verona, where Romeo and Juliet swore each other eternal love, is universally known as one of the most romantic towns in the world. 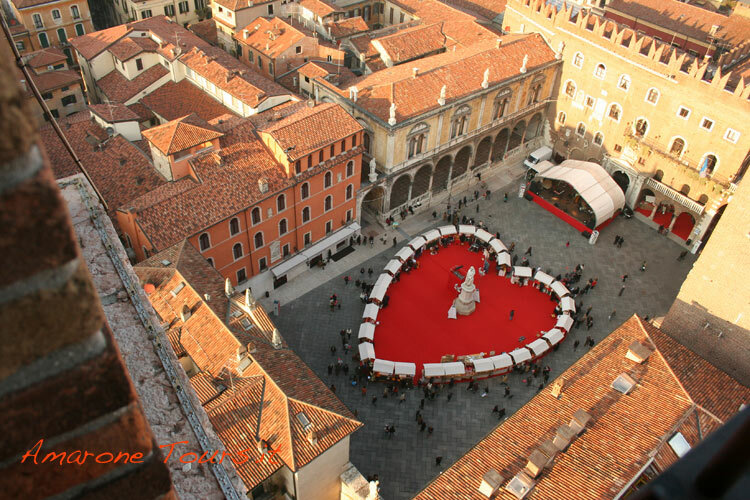 It doesn’t surprise that every year Verona becomes an even more special place during the week leading to February 14th: Valentine’s day. It is called “Verona in Love“ and it’s a week of special events dedicated to all lovers who want to spend a romanitc week end in Verona. 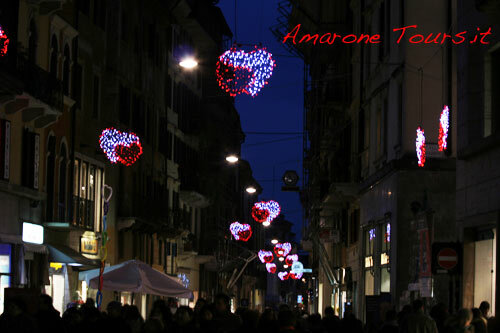 Streets in the city center are decorated with big lit up hearts and a huge red hearts is painted on the pavement of the central piazza dei Signori, one of the most elegant squares in Verona. It can be admired only from the top of Lamberti tower (XII Century), Verona highest building with its 84 meters, together with a breathtaking 360° view above the old town. But don’t worry there is an elevator taking you up to the 84m height of the tower. Shop windows are also decorated with love related themes, contributing in creating a magic atmosphere. Couples can access Juliet’s house and other monuments and museums in Verona paying only one ticket. Plays, concerts, dance and art events take place in the streets, squares, palaces and other wonderful locations in Verona. At Juliet’s house, “Cara Giulietta” (Dear Juliet) prize is awarded to the most beautiful letter selected among all those addressed to Shakespeare’s heroine during the previous year. It is actually possible to write Juliet. Volunteers of Juliet’s Club answer to all letters addressed to Juliet from all over the world. Juliet’s Club became famous after Holliwood movie “Letters to Juliet”. Many nice restaurants in Verona city center and in the province offer discounted and special menues for couples, where chocolate has often a special place. Recioto, the sweet wine made with semi-dried grapes in Valpolicella, is one of the best pairing with chocolate based desserts. And even the dry Amarone, especially if a long aged one, is excellent with a piece of dark chocolate. Valentine’s day in Verona can be a good chance to discover and appreciate some of its most famous wines with a wine tour of Valpolicella wineries or in one of many cosy wine bars in Verona city center. 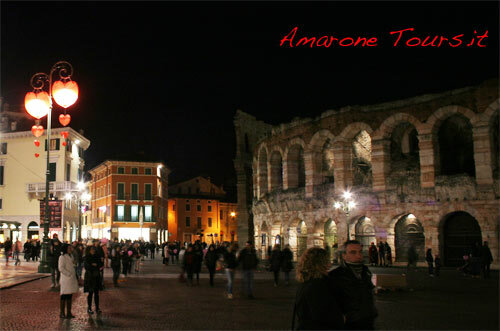 Do not hesitate to contact Amarone Tours for further information on Valentine’s day in Verona and on wine tours in wine producing regions around the town.